We have to read and Update the Custom Webpart properties which we have created on the webpart.cs. Hope you are aware how the Custom Webpart properties created thats why you came to this page to know about how you can read and update the custom Webpart Properties. So if you see the above picture i have created a Custom Properties called the "Container ID" Whose value right now is "ABC". 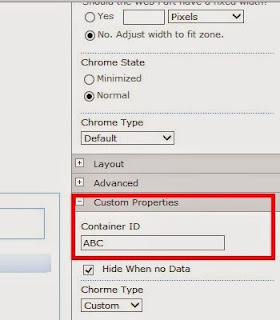 We have to read the Container ID in some other Page with the Help of Webpart ID and Page URl where the Webpart is associated. So at first i have created a Custom Edit menu for the webpart that you can learn from my previous post . I have associated the Page URL and Webpart ID with custom Menu, on click of the custom menu it open an application Page. On Page Load of the Page I read the PageURL and Webpart ID as query string. 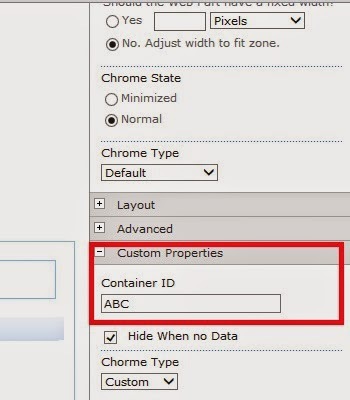 By using the above method you can read and Update the Custom webpart Properties in SharePoint 2010. Let me know if you have any more query on this. Ready to accept your suggestion.